This is Captain Ferry, who has temporarily taken up residence with THIS IS NAIVE. 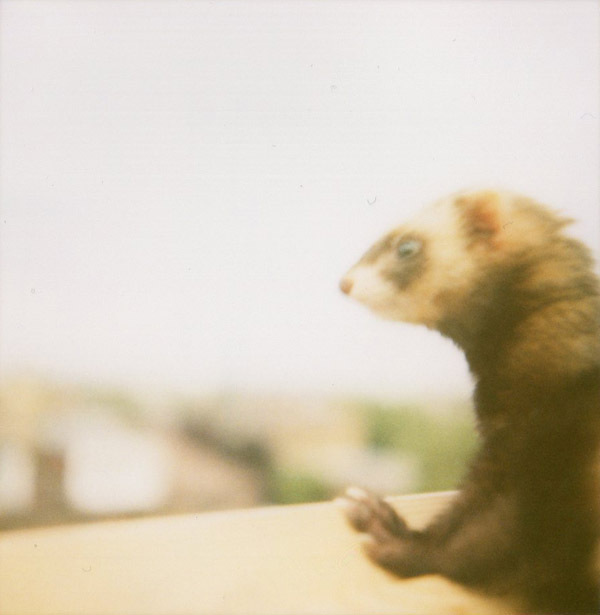 I plan to name my ferret Trotter. Trotter was H's grandmother's maiden name. The perfect name for a hipster kid, no? But since we're not planning on having one, why let it go to waste? Adorable but stinky little buggers -- the odor is really terrible. a ferret??? i vote for dog! you'd probably enjoy steve, who seems to think he is one. one of his many names is ferret bueller. Ferrets are amazing and they really don't stank too much. You can't bathe them more than once a month or it stimulates oil secretion, but if you clean their bedding every week they really dont smell awful......especially since all ferres are descented these days. Also be sure to get your ferret from a reputable source there are lots of horror stories about adrenal gland failure from poorly bred farms like marshalls... which retails at big pet store chains and mall pet stores.... also be sure to feed your ferret the ferret foods NOT cat food. i guess i shouldn't be annoyed that lauren beat me to mentioning steve nash (i was going to suggest borrowing him) as he is *her* pet. @nikki STOP. IT. now I really want a ferret. Please. Do not do it. They are SO FREAKY. They stink to high heaven. In my dorm freshman year, we kept smelling this strange smell. Come to find out, the girl in the room next to us was smuggling a ferret. One day it got loose and no one could find it. My roomate opened her closet door and the damn thing jumped out on her. It was scary. We still talk about it. There was some major poop in that girl's dorm room. Ew. trotter was his first name? that's so cool. i always thought about getting a dog and calling it mao - the chinese word for cat. kinda fun, right? So...moral of the story is don't get a ferret in college? Dude, *I* smelled bad in college. Why wouldn't my pet rodent smell bad too? GET ONE NOW. And for the record, though I love my dog TO PIECES, she never sits in the refrigerator waiting to hand out refreshments. FAILpuppy. HAND YOU A CUP? they can DO that? aren't these the things that bite you in your sleep and have creepy beady eyes? I find my only objection to ferrets is that they are ferret-y. Which is obvious, undeniable and also sort of hard to argue. So, no ferrets for me. If you do get one, please for the love of god don't become one of those people who walk them around in public on leashes. Even weirder than having a cat on a leash. i think ferrets are most likely out of any type pet to eat your face off if you die home alone.